The Action OHS Consulting team has developed a cloud-based OHS software solution that supports businesses with health and safety management and compliance. With over 250 workplaces already using the system – including a number of Australian-based global retailers reaching beyond Australia into New Zealand, Asia, UK, and USA – the solution is seeing considerable success and growth into 2018. Because, importantly, it is a solution that not only speaks to safety professionals but also to businesses without dedicated health and safety personnel or resources. How does it work for non-health and safety people? The solution comes with over 100 ready-to-go templates and workflows – including a complete and fully configurable Safety Manual, which has been aligned with the international standard to provide guidance to businesses about what tasks to complete. But what’s more, as a health and safety consulting company, our experienced consultants can ensure that these configurable health and safety documents are aligned with the needs of any business. This ensures that the implementation of the system is practical, appropriate and clear for a non-health and safety person. It is here where Safety Champion sets itself apart from the other software products that are available. Safety Champion is more than just software. It is a holistic solution developed by health and safety professionals, which can guide businesses towards better health and safety practices. The Action OHS Consulting team are on the ground working with Australian businesses every day. We have seen the frustrations businesses experience trying to comply with the laws and we know what is needed. So, essentially, Safety Champion was created to replace the reliance on the Safety Manual – which we often observe is sitting on a shelf, collecting dust and not being used by anyone! We know that the large majority of people want to do the right thing. But, historically, the problem has been knowing what the right thing is. To ensure ongoing sustainability, we have aimed to build in independence. Safety Champion will ensure that that your health and safety system can be managed by you, and will be followed through even if you don’t have access to a safety officer or one of our consultants. Sounds too good to be true? It isn’t! 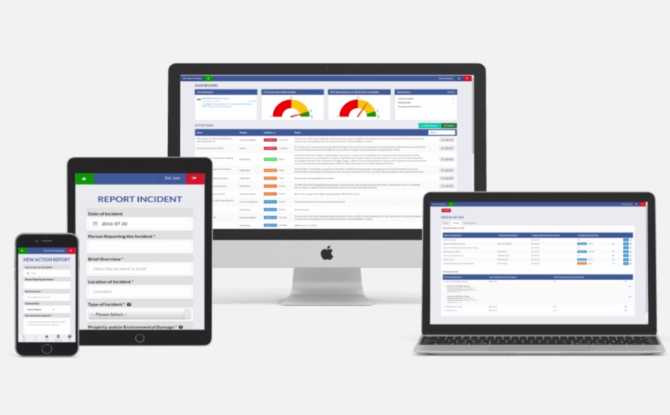 Interested in finding out more about Safety Champion OHS Software? Simply fill out a Contact Us request and one of our experienced and qualified health and safety consultants will be in contact.